In October 2011, a green roof was installed on the tallest section of the Museum building. In October 2014, our enormous five-story solar wall went "live." In October 2017, we opened our Stormwater Collection Courtyard. 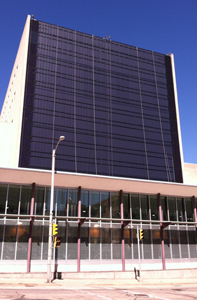 MPM features 234 solar panels on its south-facing tower wall, each measuring about 4 feet x 6.5 feet. The panels are linked to a kiosk located on the ground floor that provides near-real-time data on the energy generated by the panels. This kiosk also provides information on outside environmental conditions as well as an overview of how solar panels work. 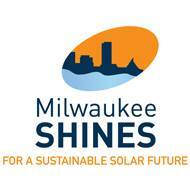 The solar panels were made possible with a gift from Chris Abele. This kiosk was made possible with the support of Milwaukee Shines. A time-lapse video of the construction of MPM's Green Roof. In October 2011, a green roof was installed on the tallest section of the Museum building, six stories up. MPM’s green roof is 4,100 sq. ft. and houses more than 1,000 biotrays planted with sedum. MPM was awarded a grant from the Milwaukee Metropolitan Sewerage District's 2011 Regional Green Roof Initiative Program, a program that aims to keep water out of the regional sewer system by capturing it on rooftops. It is estimated that MPM’s 4,100 sq. ft. green roof will capture 90,000 gallons of storm water each year, based on an average rainfall of 34 inches each year. Biotrays are 17” x 17” x 3” deep, composed of coconut fiber and biodegradable. Most of the trays were delivered with pre-grown plants, however 75 trays were left unplanted. Students from La Causa and Notre Dame Middle Schools in Milwaukee, who were in the Museum’s yearlong afterschool program on sustainability, helped to plant the rest of the biotrays. A total of 3,520 sedum plugs were planted on the roof. In addition to keeping 90,000 gallons of storm water out of our regional sewer system, a green roof has many benefits, including oxygen production, heat reduction, building insulation, and protection of roofing material to increase the roof’s lifespan. A green roof's plants trap air particulates and produce oxygen through photosynthesis. They also use heat energy during evapo-transpiration, a natural process that cools the air as water evaporates from plant leaves. Evapo-transpiration and the shading provided by plants help counter the Urban Heat Island Effect brought about by reflective and impermeable surfaces in cities and suburbs. Green roofs protect the roof membrane from harsh weather and ultraviolet (UV) radiation. Because of this, they can last twice as long as traditional roofs. Green roofs also have a fairly stable surface temperature, remaining at air temperature or cooler while traditional rooftops can soar up to 90º F (32º C) above air temperature. The addition of growing medium and vegetation insulates the building from intense temperatures and minimizes heat gain. Even a six-inch deep green roof can reduce summer energy demands by as much as 75 percent. MPM’s Green Demonstration Project will aid in the fight to keep Lake Michigan’s water clean and usable for drinking, recreational, and supporting wildlife purposes. This project will help keep water out of the tunnel systems during storms, thus aiding in the effort to minimize stormwater intake into the combined tunnel system in Milwaukee, and ultimately reducing the need to empty the tunnels during heavy rains in which untreated water, raw sewage, and contaminants enter into Lake Michigan. Renovation of the 9,500 square foot area includes removal of current non-native landscaping and replacement with native plantings that can withstand long periods of exposure to drought. A unique bladder and stormwater collection system is interconnected via underground aqueducts that maximize stormwater collection and the system’s infiltration properties. Micro-porous pavement system in the form of meandering paths are enhanced by rain barrels and cisterns located throughout the project area. We’ve even included a space for educational programming!